Stovetop smoking, once the domain of restaurant chefs looking to diversify their menu without investing in an industrial smoker, is now a popular and affordable alternative for home cooks, too. If you want the delicate flavor of home-smoked food without the worry of having a large smoker on the deck, then you should consider stovetop smoking. I’m an avid barbecuer and often smoke large Boston butts, whole slabs of ribs and briskets in a Grill Dome ceramic cooker or a Weber Smokey Mountain Cooker™ vertical smoker. Recently, however, I’ve been experimenting with stovetop smoking using a unit manufactured by Camerons Professional Cookware (seen at top). Wood shavings in the bottom of the smoker. This version of the stovetop smoker is easy to use. Basically, it’s a rectangular box with a drip tray and rack for the food. A sliding stainless steel cover prevents the smoke from escaping. To use it, you place a tablespoon or so of special wood shavings (or smoking pellets) in the bottom of the stainless steel pan, put the drip pan into the smoker and place the smoking rack over the drip pan. Add the meat, fish, or vegetables and heat the partially-closed smoker over medium heat. When wisps of smoke begin to appear, you slide the cover shut and smoke-cook for the desired time, usually 20 to 30 minutes. For larger cuts of meat, the pan is transferred to a preheated oven to finish the cooking. 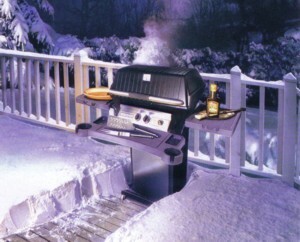 The smoker can also be used on a grill or campfire and may also be used for steaming, roasting and poaching. Although it’s advisable to have a good exhaust fan in your kitchen when using a stovetop smoker, surprisingly little smoke escapes from the cooker. The smoke that does escape adds a nice aroma to the kitchen that permeates into the dining room to whet your guests’ appetites! Camerons’ cookbook, Camerons Recipe Collection, which also includes recipes using the company’s other cookware products, notes that the temperature inside the smoker is about the same as a 375 degree F. oven, allowing fish to be cooked in about 25 minutes, boneless chicken breasts in 35 minutes, and vegetables in 8 to 18 minutes. The smoker may also be used for smoking chile peppers, nuts, cheese, ribs, hamburgers or almost anything you’d like to smoke-cook. Smoking materials are not limited to hickory or oak woods but can include apple, cherry, maple, mesquite, apricot, cedar, grape vines or any combination of those. Fruit woods are generally mild and impart a sweet flavor that enhances but doesn’t hide any natural flavor. Camerons’ cookbook suggests using apple for game, fish, and poultry; cherry for duck and vegetables; hickory for pork, ribs, or chicken; maple for cheese and vegetables; oak for almost any smoking; and pecan for pork, game, and lamb. Candy Weaver of BBQr’s Delight recommends using black walnut pellets for red meat, pork, venison, and other game meat; orange pellets which produce a “tangy citrus taste” for pork, poultry, fish, and seafood; and mulberry pellets which impart a “sweet, tangy blackberry” taste for pork, ham, and poultry. There’s one drawback to the stovetop smoker: it’s too small for large cuts of meat to be covered with the sliding stainless steel cover. The solution is simple…use heavy-duty aluminum foil to create a tent over the meat and tightly seal the edges around the lip of the smoker. By using the aluminum tent, I’ve been able to successfully smoke whole turkeys, large rib roasts, bone-in pork roasts, and brisket flats. In researching and testing for this article, I developed several recipes that work especially well in stovetop smokers. 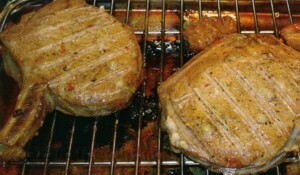 Boneless pork loin is naturally very lean and very easy to overcook, so watch it carefully. The apple stuffing nicely compliments the relatively mild flavor of the pork. Serve with roasted sweet potato wedges, sugar snap peas, and cranberry sauce. Note: This recipe requires some advanced preparation. Lightly trim any fat on the roast and score any remaining fat; butterfly the pork loin and lightly season the inside surfaces with Cajun spice. Spread stuffing inside the butterflied loin, fold the top section over the stuffing and tie the sections together with several pieces of butcher’s twine. Season the outside of the loin with Cajun spice. Prepare the stovetop smoker with 1 1/2 tablespoons of apple wood shavings under the drip pan. Position the drip pan and rack in the smoker. Place the roast on the cooking rack, fat side up, and cover all but one corner of the smoker with heavy-duty aluminum foil. Place the smoker on the stovetop over medium heat. After smoke develops, tightly seal smoker and smoke for 30 minutes. Carefully transfer the smoker to the oven and continue cooking another 45 minutes. Remove the aluminum foil and reserve. Continue cooking until the roast has an internal temperature of 155 degrees F., about another 20 to 25 minutes. 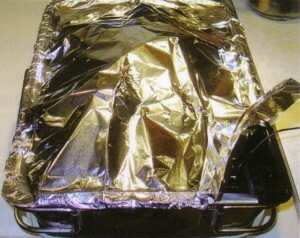 Remove the roast from the cooker, tent with reserved aluminum foil, and allow it to rest for 10 minutes before slicing. Extra stuffing may be put in a buttered casserole dish and baked, covered, at 350 degrees F. for about 30 minutes. In a medium skillet over medium-high heat, melt the butter. Add the celery and onion; sauté for 5 minutes. Add the chopped apple and minced jalapeño; cook until the apple is tender, about 5 minutes. Season with thyme, rosemary, parsley, salt, and pepper. Remove from heat. This recipe combines a marinade, an injected marinade, and a stovetop smoker to create smoked pork chops that equal what comes out of the offset smoker in warmer months. Leave the cover slightly open until a light smoke develops (about 10 minutes or so) then slide the cover completely closed and smoke the chops for 30 minutes while preheating the oven to 400 degrees F. Serve with garlic mashed potatoes and sautéed green beans. Note: This recipe requires advance preparation. Evenly trim any fat on the pork chops to a 1/4-inch thickness. Score the fat along the edges to prevent the chops from curling as they cook. Prepare the marinade by combining apple juice, honey, soy sauce, red pepper flakes, black pepper and ginger in a mixing bowl. Strain 1/4 cup of the marinade into another bowl and reserve. 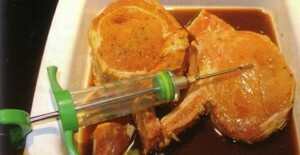 Using the strained marinade and a “Cajun Injector” kitchen syringe, inject the pork chops with the reserved marinade and place the chops in a resealable plastic bag. Add the remaining marinade to the bag and marinate the chops, refrigerated, at least 4 hours or overnight. Remove the chops from the marinade and pat them dry. Brush with olive oil and season with coarse kosher salt and freshly ground black pepper. Prepare the stovetop smoker by placing 1 1/2 tablespoons of apple, cherry, or hickory shavings (or any combination) into the smoker and adding the drip pan and rack. Position the chops on the cooking rack, slide the cover almost closed and place the smoker on a cooling rack. If desired, use the pan drippings to make a brown sauce for the chops. Carefully place the smoker in the preheated oven and bake the chops for 8 to 10 minutes or until the chops reach an internal temperature of 155 degrees F. Allow the chops to rest for 5 minutes before serving. There’s nothing quite like prime rib, especially slow-roasted and lightly smoked with apple wood and mesquite to add another layer of flavor. This recipe combines a dry rub for the meat and pan drippings that makes a great au jus. If you like, the roast could be dry-aged in the refrigerator to enhance the flavor and tenderness even more. Age the beef for up to a week by placing it, uncovered, on a wire rack over a drip pan in the refrigerator. When ready to prepare the roast, trim off any dried pieces and rinse the roast under cold water. Take into account that the roast will lose 10 to 15 percent of its weight during aging, so purchase a larger roast than usual. The roast should have a moderately thick layer of white fat over the meat. Trim off the fat cap to about 1/4-inch thickness, but don’t trim all the fat. That’s what imparts a marvelous flavor to the meat and helps retain moisture as it cooks. Have your butcher cut the bones from the roast and re-attach them for easier carving. Serve with horseradish cream sauce, pan drippings, sautéed green beans with caraway and twice-baked potato. Note: This recipe requires advance preparation. Combine dry rub ingredients in a small bowl. Coat the outside of the prime rib with a thin layer of Creole or Horseradish mustard and evenly apply the rub. Wrap the roast with plastic wrap and refrigerate 6 hours or overnight. Remove the roast from the refrigerator and prepare the stovetop smoker by placing wood shavings under the drip pan, adding the drip pan and rack and placing the roast on the rack fat side up. Insert a remote reading thermometer into the middle of the roast. Tightly cover all but one corner of the smoker with heavy-duty aluminum foil. Place the smoker over medium heat and heat until smoke begins to appear. 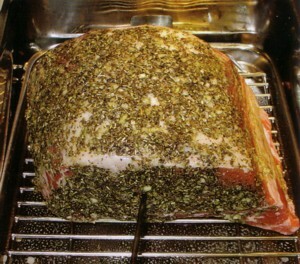 Once smoke appears, tightly seal the smoker and smoke the roast for 30 minutes while preheating the oven to 350 degrees F.
Transfer the smoker to the preheated oven and continue cooking another 16 minutes per pound or until the roast reaches an internal temperature of 120 degrees F. (for a rare to medium-rare. For medium meat, remove the roast when it reaches 130 degrees F.) Remove the roast from the smoker and allow the roast to rest for 15 minutes, tented with aluminum foil, before carving. Love the taste of lamb for Easter but don’t want to go to the bother of cooking a whole leg of lamb? This recipe combines stovetop smoking with slow cooking to produce fall-off-the-bone tender meat with a very rich, flavorful sauce. Although wonderful the day it is prepared, this entrée is even better after mellowing for a day. You’ll need a stovetop smoker and a slow cooker (alternatively, the lamb shanks could be braised in a 325 degree F oven for 3 to 3 1/2 hours after being smoked). Serve with roasted spring vegetables (recipe follows) and garlic mashed potatoes. Smoke and braise extra shanks for a wonderful lamb stew. Trim any exterior fat from the shanks and season them with salt and pepper. Prepare the stovetop smoker by adding 2 tablespoons of wood chips (1 tablespoon of hickory and 1 tablespoon of apple) under the drip pan. Place the lamb shanks in the smoker and tent aluminum foil over the shanks. 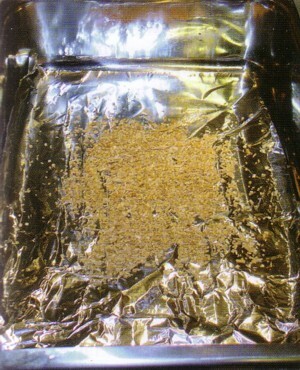 Leave one corner of the foil loose and heat the smoker over medium heat. Once smoke begins to show, tightly seal the foil and smoke the shanks for 20 minutes. Remove smoker from the stovetop and place shanks on a plate. Heat the oil in a large heavy skillet over medium high heat. Add 2 lamb shanks and brown them on all sides until golden brown. Remove them to a plate and brown the other 2 lamb shanks. Transfer the shanks to the plate. Drain off all but 1 tablespoon of drippings from the skillet. Add the onions, carrots, and celery to the skillet and cook them, stirring constantly, for 3 to 4 minutes. Stir in the garlic, tomatoes, parsley, basil, oregano, peppercorns, wine, and stock; heat to boiling. Transfer the vegetables and liquid to a slow cooker set on high. 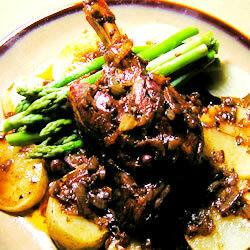 Place the lamb shanks on top of the vegetables and cook, covered, for 4 to 6 hours on high or 9 to 10 hours on low. Remove the shanks and keep warm while finishing the sauce. Cameron’s Stovetop Smoker is available from Camerons Professional Cookware, Colorado Springs, cameronscookware.com. Other rectangular stovetop cookers include the Max Burton™ Stovetop Cooker manufactured by Athena Brands, Gardnerville, NV, and the Cajun Injector™ Stovetop Cooker produced by Bruce Foods Corp., New Iberia, LA. BBQr’s Delight smoking pellets are available at BBQrsDelight.com. 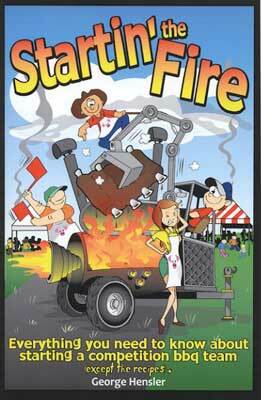 Mike Stines has been conferred a doctorate in barbeque philosophy (Ph.B.) degree from the Kansas City Barbeque Society. He is the author of Mastering Barbecue.